There sure are a lot of pretty singers in country music these days, but they don’t always have the power to evoke the spirits and sorrows of those who dwelled in rural landscapes and rugged terrains of the past. Johnny Cash had that power, and Merle Haggard is touched in that way, where they open their mouths and it’s as if ghosts come flying out in frayed regalia, soaring low above the crowd to bring past lives and past troubles straight to the forefront of the consciousness until their presence is as palpable as if they were still living in the present day and standing right in front of you. A voice which is bolstered by such aforementioned attributes is one thing. When this process is aided by evocative narratives that awaken what feel like true to life characters in the mind of the beholder because of the richness of language, the experience is even that much more immersive. That’s what one experiences in audience of Imaginary Appalachia. Once again the great frozen north has birthed an artist that is more gifted in the native tongue of the American South and West than many of the music’s indigenous-dwelling performers. But when you’re origination point is a remote location by the name of “Swift Current” and is surrounded by the wild prarie of Saskatchewan, your claim to the music of the country is as valid as anyone’s, if not more. Like a crusty old bard who pulls his pack mule up to the front of a frontier saloon, or a trapper who parks a sleigh packed with pelts and trinkets to trade in front of a warm inn, walking in the door to earn a meal and respite by sewing tales and entertaining locals for the coins they throw, Colter Wall bends to the task of timeless storytelling, squinting his eyes as he sings like the exit of the stories is so heartfelt it’s painful, and hopes enough will listen to justify the effort. His music is much older than his age, and whether it’s a tender love story, or a torrid murder tale, each story is delivered with care. Colter Wall and the stories of Imaginary Appalachia find the bleakness of life that first gave rise to country music in its primitive, early forms. A song like “Caroline” is both sweet and tragic, while the unrepentant tone of “Ballad of a Law Abiding Sophisticate” has all the blood of “Folsom Prison,” without an ounce of the regret, making the result that much sinister. 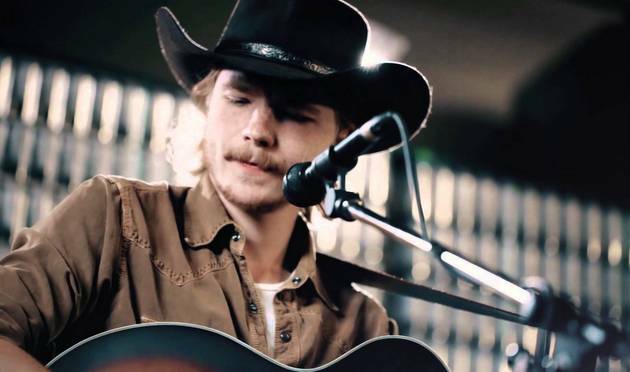 Colter Wall is a master of mood, and his voice and image fits the part with eerie perfection. The coldness of “Living on the Sand” and Townes Van Zandt’s “Nothin'” is bone penetrating. But it does still feel a little early for Mr. Wall. Does he want to be another Lincoln Durham or Shakey Graves with his bass drum rig sitting behind his boot heel and songs intended to haunt? Because that could make him just one of many. Or does he choose to hone in more on his singing, which could hold a career on its own? Or does he choose to try and take his songwriting to the transcendental level? Perhaps he can choose all three, and that’s what he tries to do in Imaginary Appalachia, but it’s rare that you can be all things to all people, especially when the appeal of those things can be quite niche. Right now his style precedes his songs. And though the style is great, the songs are better. No matter, what is certain is that Colter Wall has that something that makes ordinary men into extraordinary country music artists—that unsettled, deep seated fire behind the eyes. 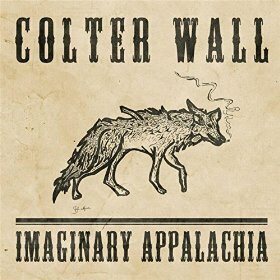 Much is still to be determined, and at only seven songs, Imaginary Appalachia only gives you a strong taste, with the full breadth of Colter Wall to be revealed in the future. One things for certain, I will sure be paying attention. Wow…..this is some really great stuff! Might be one of my favorite discoveries from this site next to Michael Monroe Goodman. My favorite track is “Ballad of a Law Abiding Sophisticate” for now, but I really enjoyed everything. As an aside, these types of reviews are beginning to become some of my favorite things on the website. There’s still a lot of great music out there even in the independent scene that’s going unnoticed and as much as I love the big dogs like Isbell and Simpson, I get a thrill out of hearing new artists like Colter. Thanks Trigger! Wow… This is awesome stuff. That is the gospel right there! Storytelling as an art is at an all-time low, in music, film and literature. Even my parents have fallen into the trap of bad film, bad books, and Blake Shelton. What we need is less spectacle and more story, in ALL of our art. That’s why “The Searchers” was a masterpiece even without all the fancy effects, that’s why kids will still be reading “Redwall” for decades, that’s why (hopefully) Isbell is going to win big in February. Haha I like the redwall reference, I definitely understand that sentiment. It’s one of my favorite book series… I spent a lot of money to get autographed copies. I also have the hat, wallet, shirt and keychain. This is some truly fantastic music, especially coming from someone who’s only 19! Thank you for profiling this Trigger, I’m loving everything that I’m hearing, especially “Sleeping on the Blacktop”. I also think it’s interesting that Colter is actually the son of Brad Wall, who is the current Premier of Saskatchewan and is considered one of the front-runners to lead the Conservative Party of Canada. Just goes to show that great music can come from anywhere. Wow. Was definitely not expecting that voice. If I didn’t know better I’d thought Richie Havens had gone country lol. That was great. That is a really interesting voice. Found this guy because he has the same name as me. His music is pretty damn good too. Been listening to him since hearing Brock Lesnar mention him on a podcast. Have watched the Video for Kate McCannon at least 10 times since you first posted this. Damn good song. this dude is ill. need to hear more. Thanks for the review Trigger this is another absolute pearl you have turned us on to. Ok the more I listen to this the more I like and become convinced his voice is Jeff Healey singing from the grave. Two thumbs up! I discovered him last fall opening for Shooter Jennings. He’s a great guy and this is a wonderful debut album!